Million Dollar Quartet is the hit musical with a book by Colin Escott and Floyd Mutrux based on the true events of a night in rock 'n' roll history. It dramatizes an actual recording session on Dec. 4, 1956 at the Sun Records recording studio in Memphis, Tennessee when Johnny Cash, Jerry Lee Lewis, Carl Perkins and Elvis Presley assembled for an impromptu jam session. The story explains Perkins was there to record songs with a new performer, Jerry Lee Lewis. Elvis happened to visit the studio with his girlfriend at the time, just as Johnny Cash stopped in to speak with recording impresario Sam Phillips, who is eager to re-sign Cash to a new contract, unaware he has already signed with Columbia Records. "...Daryl Brooks, who has directed hits at Black Ensemble Theater and Porchlight Theater provided an interesting twist by bringing in Aeriel Williams to play Dyanne; and it worked! Williams' voice is exceptional, and she wowed the audience with her range and power. She only sung two songs but definitely got the loudest applause. Kudos to Theatre At The Center for opening the door to diversity and showing Indiana another great talent at the theater!" "...Theatre at the Center's "Million Dollar Quartet" will have you dancing in your seat! On December 4, 1956, Johnny Cash (Tommy Malouf), Jerry Lee Lewis (Michael Kurowski), Carl Perkins (Zachary Stevenson) and Elvis Presley (Zach Sorrow) did a little jammin' at Sun Records Studio in Memphis. 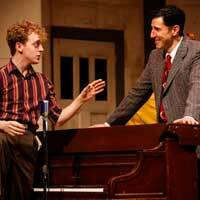 "Million Dollar Quartet" is based on the events of that night. Rock and roll lovers, get your tickets now! This show might be the best I've seen." "...While the despair and anxiety of tomorrow may stifle our hope and excitement for the future, Theatre at the Center reminds us that there is a bright and innovative future ahead if we will it to be. In smiling at our past, we gain the courage and hope to do better in the present. Through the power of the nation's favorite music, the Million Dollar Quartet is guaranteed to wow crowds."